Mary Margaret Weidner. Courtesy of Die St. Mariengemeinde zu Buffalo Grove, Illinois via Raupp Memorial Museum, Buffalo Grove, Illinois. [S11] John J. Weidner, Compiled Birth, Death, 595. [S532] 06 Jul 1860 1860 U. S. Census, Arlington Heights, Cook County, Illinois, USA, Wheeling Township, page 154, dwelling 1077, family 1038. [S872] Mary Weidner, State of Illinois; Department of Public Health - Division of Vital Statistics; Standard Certificate of Death. [S902] Jacob Weidner, Bark Clementine Microfilm, 02 Sep 1851, 104. [S11] John J. Weidner, Compiled Birth, Death, 666, 683. [S11] John J. Weidner, Compiled Birth, Death, 666 & 683 state circa 1844; 666 birthdate extrapolated from age at time of death 80 yr, 7 mo, 17 da - 31 July 1843. [S465] Cook County Herald, 21 Mar 1924, p. 6, col. 2, Obituary states she was born 3 August 1843. 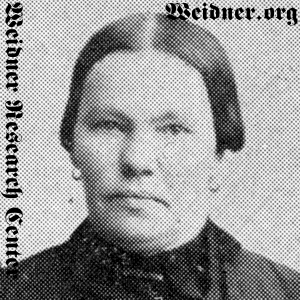 [S532] 06 Jul 1860 1860 U. S. Census, Arlington Heights, Cook County, Illinois, USA, Wheeling Township, page 154, dwelling 1077, family 1038, 1860 census states she was 17 years old and born in Bavaria. [S872] Mary Weidner, State of Illinois; Department of Public Health - Division of Vital Statistics; Standard Certificate of Death, Birthdate, country. [S1063] Frank G. Weidner, State of Illinois; Department of Public Health - Division of Vital Statistics; Certificate of Death, Birth country only. [S11] John J. Weidner, Compiled Birth, Death, 666. [S465] Cook County Herald, 21 Mar 1924, p. 6, col. 2, obituary states she was married 3 June 1868. [S874] Pankratz Weidner, State of Illinois; Department of Public Health - Division of Vital Statistics; Standard Certificate of Death, Wife's name is not stated. [S872] Mary Weidner, State of Illinois; Department of Public Health - Division of Vital Statistics; Standard Certificate of Death, Buffalo Grove is scratched out. [S405] The Cemetery Committee, Vernon Township Cemetery Inscriptions, Lake County, Illinois, 103, burial date, cemetery name, township, county, state. [S465] Cook County Herald, 21 Mar 1924, p. 6, col. 2, Burial date. [S872] Mary Weidner, State of Illinois; Department of Public Health - Division of Vital Statistics; Standard Certificate of Death, Burial date, city. [S119] Arlington Heights Herald, 24 Sep 1948, sect. 1, p. 3, col. 5. [S195] Palatine Enterprise, 28 Sep 1923, p. 5, col. 4. [S465] Cook County Herald, 21 Mar 1924, p. 6, col. 2. [S11] John J. Weidner, Compiled Birth, Death, 601. [S1063] Frank G. Weidner, State of Illinois; Department of Public Health - Division of Vital Statistics; Certificate of Death. [S11] John J. Weidner, Compiled Birth, Death, 567. [S11] John J. Weidner, Compiled Birth, Death, 614. [S26] Cook County Herald, 08 Jan 1904, p. 8, col. 6.